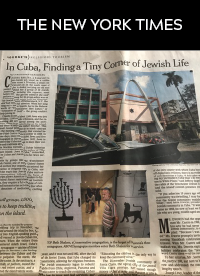 CLAUDIA BARLIYA, a 6-year-old Cuban-Jewish girl, stood on a cobblestone street in Trinidad, a small centuries-old city on the south coast of Cuba. A donkey carrying an old man passed behind her; a group of 30 Jewish-Americans, including this reporter, stood before her. The girl had asked if she could perform a song for the group, which was on a humanitarian mission with the Westchester Jewish Center of Mamaroneck, N.Y. She now had their full attention. When her song rang out — not in Spanish, but in the Hebrew words of “Yerushalayim Shel Zahav,” or “Jerusalem of Gold” — the group couldn’t help joining in.